We love Pollution Pods by the artist Michael Pinsky. Artist Michael Pinsky is creating a series of domes containing pollution from cities around the world to test whether art can really change people’s perceptions of climate change. Pinsky has been commissioned by the Norwegian University of Science and Technology (NTNU) to create an installation in Trondheim for the culmination of Climart, a four-year research project that examines the underlying psychological mechanisms involved in both the production and reception of visual art. 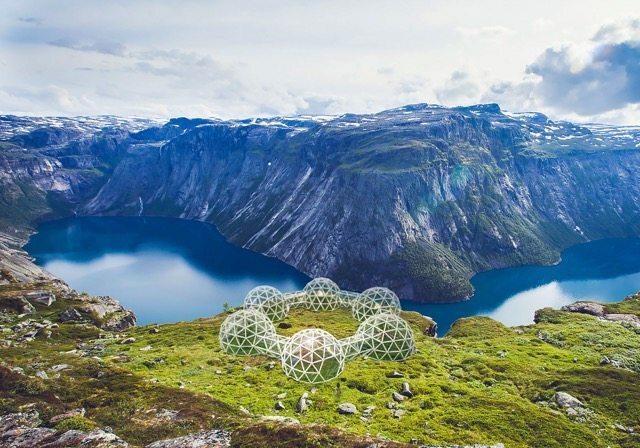 Pollution Pods consists of five geodesic domes, connected to form a ring, each containing the air quality of a different location in world: Beijing, Delhi, London, São Paulo and Tautra, a peninsula in the north of Norway. A carefully mixed recipe will emulate the relative presence of ozone, particulate matter, nitrogen dioxide, sulphur dioxide and carbon monoxide that pollutes these cities. Starting from a dome containing refreshing air from the Norwegian coast, the visitor will pass through increasingly polluted cells, from dry and cold locations to hot and humid. Pollution Pods with be shown as part of the STARMUS festival in Norway, an international gathering focused on celebrating astronomy, space exploration, music and art. Scientist and astronomers such as Stephen Hawking and Buzz Aldrin will be speaking at the festival. Michael Pinsky is a British artist whose international projects have created innovative and challenging works in galleries and public spaces. He has undertaken many residencies that explore issues which shape and influence the use of our public realm. Taking the combined roles of artist, urban planner, activist, researcher, and resident, he starts residencies and commissions without a specified agenda, working with local people and resources, allowing the physical, social and political environment to define his working methodology. His work has been shown at: TATE Britain; Museum of Contemporary Art, Chengdu; Saatchi Gallery; Victoria and Albert Museum; Institute for Contemporary Art, London; La Villette, Paris; BALTIC, Gateshead; Centre for Contemporary Art, Glasgow; Modern Art Oxford, Milton Keynes Gallery, Cornerhouse, Manchester; Liverpool Biennial, Centre de Création Contemporaine, Tours; Armory Center of the Arts, Los Angeles and the Rotterdam International Architectural Biennial. Dr Michael Pinsky graduated from the Royal College of Art. He has received awards from the RSA, Arts Council England, British Council, Arts and Business, the Wellcome Trust and his exhibition Pontis was shortlisted for the prestigious Gulbenkian Museums Award. Two of the hardest aspects of communicating the facts of climate change are affecting both decision-making and behavioral change. Although researchers have explored visualizing climate change (Nicholson- Cole, 2005; Sheppard, 2005, 2012), research about the contribution of contemporary art to the topic has been scarce. Climart is a four-year, multi-disciplinary research project run by a team of international researchers in psychology, natural science and the arts. The project is led by and housed at the Institute of Psychology at NTNU, Trondheim, Norway. Launched in 2014, the research is looking at the impact that emotive visual art may have on bridging the divide between scientific information and personal responsibility. This type of artwork may well be more effective not only on those who are already concerned about the issue, but on those who are not. This entry was posted in ART and tagged Michael Pinsky. Bookmark the permalink. ← First large-scale exhibition in the UK of Jean-Michel Basquiat comes to London. Rainbow coloured cage to light up the sky over King’s Cross Wednesday 16th November 2011 – 2013. Can Art Make Us Happy?